A Safe Place is a protected area specifically for Senior Pastors’ Wives. 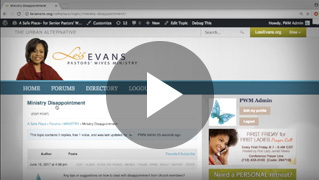 Once registered, Senior Pastors’ Wives can connect with each other to discuss topics and share wisdom. If you are new to A Safe Place, please feel free to register for this area by clicking here: REGISTER. If you have already registered, you can sign in below. Copyright Lois Evans SafePlace Forums. All Rights Reserved.